Every one of Stephen Curry’s shots drew a buzz of anticipation and many of them ended up eliciting sounds of surprise. The reigning MVP and NBA’s leading scorer was way off Sunday night in his only trip of the season to Madison Square Garden. But the champion Warriors are more than a one-man show. Even with Curry stumbling through a 5-for-17 performance, the Warriors still crushed the Knicks, 116-95. The other “Splash Brother,” Curry’s All-Star backcourt mate Klay Thompson, was on fire, and versatile All-Star forward Draymond Green had a triple-double to lead the Warriors to their 44th win in 48 games. The Warriors are chasing history, and are one game ahead of the 1995-96 Bulls, who went an NBA-record 72-10. Thompson finished 14-for-18 and scored 34 points. Green shot even better — he was 9-for-9 — and finished with 20 points, 10 rebounds and 10 assists. His ninth triple-double of the season tied a franchise record. Curry had only 13, nearly 17 points under his league-high average. The Knicks (23-27) are not even close to being in the Warriors’ class. They stayed with Golden State for a half but were overmatched in the second half. They lost for the fifth time in six games. Carmelo Anthony led the Knicks with 24 points and 10 rebounds. Kristaps Porzingis added 14 but only played 21 minutes. He was in foul trouble in the first half and had trouble staying with Green, who blew by a flat-footed Porzingis for an uncontested dunk. The Warriors had their lowest-scoring quarter of the season (18 in the first) and their best shooting quarter (82.4 percent in the second). Despite that the Knicks were only down 55-49 at the half. But the Warriors distanced themselves in the third. Leading by 17 heading to the fourth, the Warriors went ahead 89-67 after last year’s Finals MVP Andre Iguodala buried a three-pointer 1:17 into the fourth. The Knicks went on a 12-3 run and closed to 92-79 with 7:19 left. Thompson then scored inside, and after Anthony’s no-look, back-to-the-basket, over-the-shoulder shot missed badly, Curry fed Leandro Barbosa for a three-pointer that made it 97-79 with 7:24 to go. Neither team got off to a good start. The Warriors scored first with 2:41 gone and opened with a 7-0 run. The Knicks didn’t make their first basket until there was 7:45 left in the quarter. They then scored the next 14 points. Golden State was sloppy, committing eight turnovers in the first. Curry was 3-for-9, and the Knicks led 20-18. The Warriors found their rhythm in the second quarter. They put up 37 points and Curry didn’t attempt a shot. Golden State put on an offensive clinic, hitting 14 of 17 attempts. Thompson was 7-for-8 and scored 17 points in the quarter. Green assisted on seven Warriors baskets in the quarter. Before the game, Fisher said something about playing against Curry that applied to the Warriors as a whole. The Knicks didn’t get demoralized in the first half. They hung with the Warriors and trailed 55-49 at the break after Derrick Williams connected on a three-pointer at the buzzer. Eventually though, the Knicks were going to have to stop Thompson and the Warriors — and they never did. Golden State made four of its first six shots in the third quarter — Thompson was 3-for-3 — and the Warriors opened up a 64-50 lead. 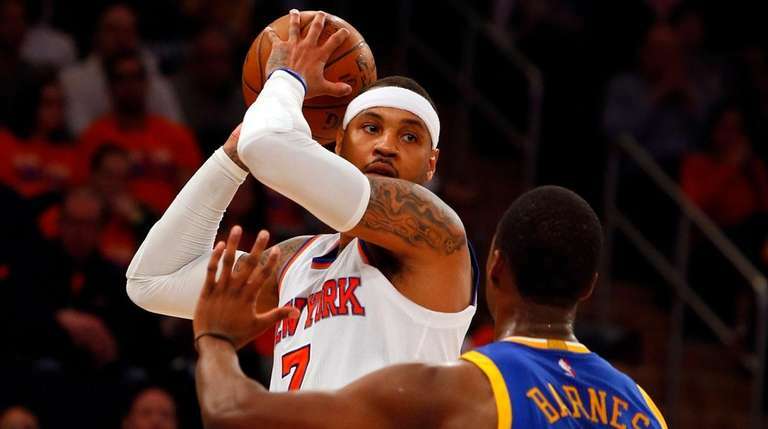 Thompson remained hot and the Knicks continued to flounder defensively. Thompson scored 12 in the third and Golden State led by 17 after Green fed Barbosa for a jumper to make it 82-65 with 26.4 seconds left in the third.